While state teacher unions are spending time, energy and money fighting the landmark Vergara v. California ruling through appeal, one group of teachers in Los Angeles is helping shape what a post-Vergara world could look like. 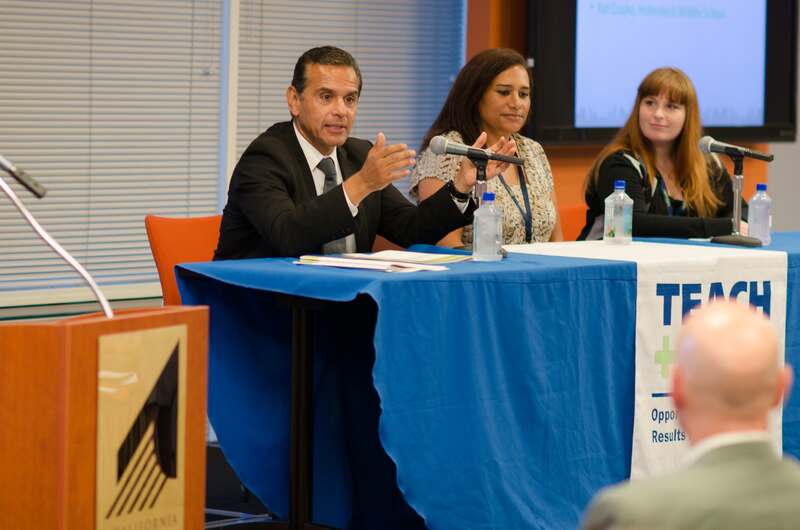 In a presentation yesterday at the California Community Foundation, former Mayor Antonio Villaraigosa joined L.A.-based teaching policy fellows with the national group, Teach Plus, in presenting ideas for change should the appeal fail. In a ruling that landed like a bomb on the educational landscape, California Superior Court Judge Rolf Treu struck down five statutes governing teacher tenure, dismissal and layoffs, concluding that they violate the state constitution by denying students access to a quality public education. If the ruling stands, the state legislature has to rewrite the laws, and yesterday’s event was designed as a roadmap. As the key speaker, Villaraigosa threw his support behind the Vergara ruling — and the group’s ideas to accommodate it. Teach Plus works to elevate the influence of teachers in policy discussions, and yesterday’s forum “is an example of that,” said John Lee, executive director of Teach Plus Los Angeles, referring to 10 Teach Plus fellows, all of them LA classroom teachers, who spent the summer researching Vergara. First up was tenure, which currently gives teachers extensive due process rights after 18 months. California is only one of five states that awards tenure within two years, according to the Teach Plus presentation. Base tenure decisions solely on performance. Require schools to provide evidence of support for teachers who receive an unsatisfactory evaluation if those teachers continue their employment. Kat Czujko, a teacher at Hollenbeck Middle School in Boyle Heights, helped write the tenure section. On the issue of dismissal, the brief said among 275,000 teachers statewide, only 2.2 teachers, on average, are dismissed each year for unsatisfactory performance, which amounts to just 0.0008 percent of all teachers in the state. Improve and expand programs that support teachers, particularly those that target new and struggling teachers. Connect teacher evaluation to the dismissal process. Improve the Commission for Professional Competence hearing process. Andrea Burke, a teacher at Dr. Owen Lloyd Knox Elementary School in south Los Angeles who helped write the dismissal section, said she had received some blowback from other teachers for participating with Teach Plus in preparing the new ideas. The next step? Teach Plus officials said they intend to spread the findings throughout the state and get them to leading state lawmakers.